What is the minimum number of participants? What is maximum number of participants? Do we have to alert our landlord? Is it possible to choose the types of cheese, wine, salami? It is possible to limit the tasting to Wine? Cheese? Salami? Will tasting techniques and food/wine pairings be taught? How much wine and food will be provided? It’s a tasting and not a dinner, however, consider a bottle of wine for 8 people, the Cheese/Cured meat plate will be 120/200 gr depending on the type of tasting. Is it possible to have more wine? Is it possible to smoke? Could you provide me with other food experience/adventures? Could you suggest other Villas or Farmhouses where to spend my holidays? 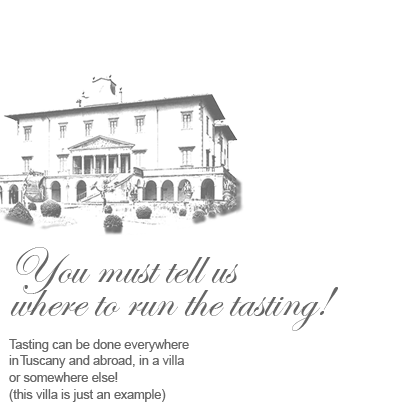 Yes we have a good network of Villas / Farmhouses / Agriturismi cooperating with us. Please contact us or look to our links. Do the cheese and Salami contain Preservatives and Additives? Our approach is to utilize mainly “ clean products “ with minimal additives. Thus, we often provide raw milk cheese with natural rind and we also take into consideration the quality and provenience of the raw materials like milk, meat, spices, salt. Regarding salami we choose products without the addition of nitrites or artificial aromas. Our goal is to provide products with no more than 5 ingredients. Many of the wines we propose are organic and some biodynamic. My husband and I did a wine and cheese pairing class with Giancarlo Russo, and it was a fabulous experience. There was an incredible selection and range of both wines and cheeses, and not only did we learn a great deal about how to pair different cheeses with their most complimentary wine counterparts, but we also learned some interesting information on the wines and cheeses themselves. It was very well organized and beautifully laid out, thoroughly educational, but of course the best part was enjoying the flavor combinations of Giancarlo’s impressive cheese and wine selection. It was such a relaxed, unique, and enjoyable experience, and we look forward to the privilege of learning more from such a knowledgeable individual as Giancarlo. On a warm September evening , Giancarlo and Susan Russo hosted a group of us at the Castello di Pomerio for a food and wine pairing event. The candlelit dinner included 5 gourmet courses and 10 exceptional wines. It was an absolutely magical night for all! Sue and Giancarlo were gracious, accommodating, well-informed and truly lovely hosts. I would strongly recommend their food and wine pairing events for any tourist looking to enhance their Italian cultural experience. Magnifico! Dear Giancarlo, Thank you and Susan for a wonderful, delicious and entertaining evening. The most interesting part was learning about why certain wines go so well with certain cheeses and meats.